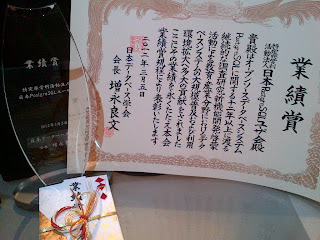 Today, Japan PostgreSQL Users Group (JPUG) has been awarded Achievement Award 2011 from the Database Society of Japan (DBSJ), the largest (umbrella) database research community in Japan, because of its activities on database research, educating engineers and promoting database technology in Japan. This is actually impressive thing in the JPUG history, and in my mind. I really appreciate many people, not only in Japan, but also around the world, who were/are working on PostgreSQL and relating activities. Thank you so much. 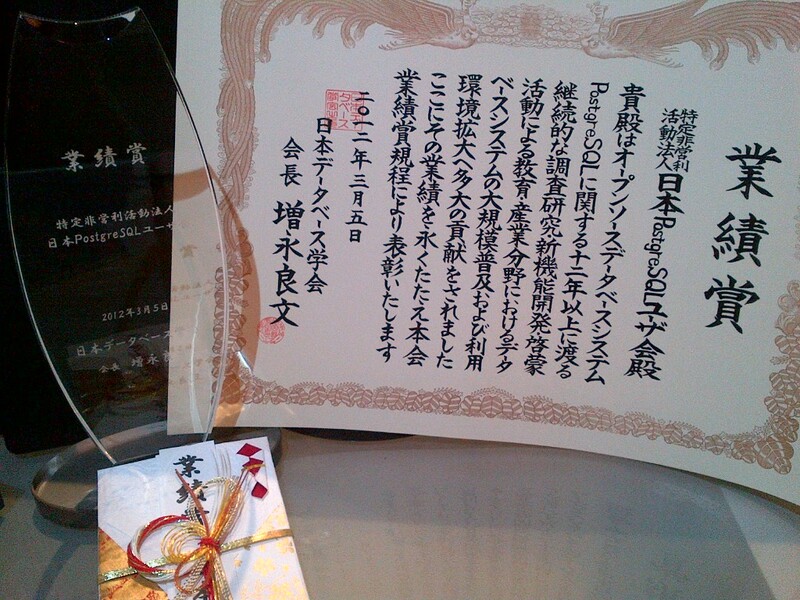 I, as chairperson of the board of JPUG directors, had a short talk, "PostgreSQL and Communities", at the ceremony today. To have the talk, I have studied the history of PostgreSQL and the communities again, and it reminded me that the database technology, particularly "relational" one, is extremely essential and long-standing in our society. I know many people in both the database research community and the database industry need something new, like "inventing the relational model", as a paradigm shift in the RDB era. However, I still think that the relational database technology never dies. And it also reminds me that I had to make my decision for deciding for my major when I was a grad student. At that time, I knew that it was not only for the grad school itself, but also would affect my career as a software engineer after my graduation. Anyway, PostgreSQL is standing on the shoulder of the giant, who is living in the database community, and is also supported by the people who are working together around the world. And I want to have a collaboration with several database communities, not only in the database industry, but also in academia, to bring something new into each community.